Ancien flacon d'eau de parfum Eden de Cacharel 100 ml (on ne voit pas le niveau mais il est quasi plein ) . By CACHAREL. EAU PARFUM. 100 ML / 3.3 FL. VAPORIZADOR SPRAY. Tienes la oportunidad de conseguir este producto nuevo, 100% original, de los pocos que quedan en el mundo. You have the opportunity to get this new, 100% original product of the few remaining in the world. Eden Classics Le Jardin Eau de Parfum 50ml Spray - For Her. The differences are the amount or the concentration of oils that are in the scents. The higher the concentration of oils, the longer your scent will last, and the less you should need to apply. Cacharel Eden Eau de Parfum 50ml Spray - For Her. The differences are the amount or the concentration of oils that are in the scents. The higher the concentration of oils, the longer your scent will last, and the less you should need to apply. Cacharel Eden Eau de Parfum 30ml Spray - For Her. The differences are the amount or the concentration of oils that are in the scents. The higher the concentration of oils, the longer your scent will last, and the less you should need to apply. Eden Classics Blasé Eau de Toilette 50ml Spray - For Her. The differences are the amount or the concentration of oils that are in the scents. The higher the concentration of oils, the longer your scent will last, and the less you should need to apply. Con questa fragranza, Giorgio Armani ha voluto ricreare la calda serenità delle notti estive italiane. Credo che solo una fragranza possa catturarla nell'immaginario. possesso per risolvere la problematica. EAU DE PARFUM SPRAY 50ML. NEUF AUTHENTIQUE. Cacharel Eau d' Eden años 90 Vintage Eau de Toilette miniatura en caja Rare! The main notes are: water orris, rockrose, nectarine, peach, hyacinth, green leaves. Eau d'Eden is a lighter version of Eden, which has been launched two years after the original scent. 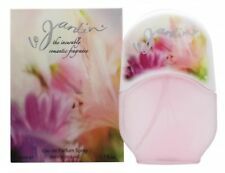 This fragrance of Eden is delicate, spontaneous and fresh. Je vous propose une eau de toilette 50 ml, sous blister. The differences are the amount or the concentration of oils that are in the scents. The higher the concentration of oils, the longer your scent will last, and the less you should need to apply. RRP: £10.95, Our Price: £7.65 - Save: 30%! CACHAREL EDEN È UNO DEI PROFUMI PIÙ FAMOSI DI CACHAREL. IN QUESTA FRAGRANZA ADATTA PER OGNI OCCASIONE SI UNISCONO LA FRESCHEZZA DELL'ACQUA CON IL GIGLIO E NOTE AGRUMATE COMBINATE CON INEBRIANTI NOTE FLOREALI DI TUBEROSA, MIMOSA, GELSOMINO, ROSA E MUGHETTO. EN ESTA FRAGANCIA ADECUADA PARA CADA OCASIÓN COMBINAR LA FRESCURA DEL AGUA CON LILY Y NOTAS CÍTRICAS COMBINADAS CON EMBRIAGADOR FLORALES NOTAS DE TUBEROSA, MIMOSA, JAZMÍN, ROSA Y LIRIO DE LOS VALLES. Cacherel Eden Eau de Parfum Spray 30 ml. Brand new in the box. Inspired by nature, this unique Oriental Floral fragrance combines distinctive Aquatic Top Notes with luscious Fruity Heart Notes and intoxicating Floral Base Notes to create a natural, fresh, sensual fragrance for Women. Top Notes: Water Lily, Lotus Heart Notes: Pineapple, Melon Base Notes : Mimosa, Patchouli Eden Eau de Parfum. 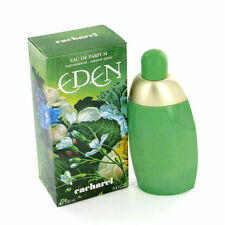 Cacharel design house launched Eden in 1994 as a floral fragrance for women. Eden notes consist of tuberose, mimose, jasmine, rose, lily-of-the-valley, pineapple, melon, patchouli, cedar, sandal and Tonka bean. Eden Classics Blasé Eau de Toilette 90ml Spray - For Her. The differences are the amount or the concentration of oils that are in the scents. The higher the concentration of oils, the longer your scent will last, and the less you should need to apply. Betty Barclay. Marke Betty Barclay. Eau de Toilette 20 ml spray. Hermoso Eden. Typ Eau de Toilette. Formulierung Spray. Fuentes de imagen. creado con | Diseño de Stevens. Eden by Cacherel was launched in 1994 and it is now one of the known Cacharel fragrances. The opening blends luminous citrus notes. The cold water freshness of water lily in the heart is combined with heady floral notes and sweet juicy fruits. EDEN de CACHAREL EAU DE PARFUM SPRAY 1.7 oz / 50 ml para mujer nuevo en caja. Fragrance Type Eau de Parfum. Al realizar un pedido desde los EE. Cellophane sealed. Ideal for present. This system allows for you to get the longest dated and genuine products available. Storage Type Lower Age Limit. Eden Classics Blasé Eau de Toilette donna 90 ml | cod. Eden Classics Blasé Eau de Toilette 90ml Spray. Garanzie e Restituzioni. EAU DE PARFUM. 50 ML SPRAY. NEVER USED & SEALED. Cacharel Eden Eau de Parfum 30ml Spray. Garanzie e Restituzioni. Eden Classics BlasÃ© Eau de Toilette donna 50 ml | cod. Eden Classics BlasÃ¨ Eau de Toilette 50ml Spray. Garanzie e Restituzioni. Eden Classics Le Jardin Eau de Parfum 100ml Spray. Prodotto autentico al 100%, nuovo e sigillato. Respirate Eden, "orientale-floreale-acquatico" che è sia fresco che sensuale. Eden Classics Le Jardin Eau de Parfum donna 50 ml | cod. Eden Classics Le Jardin Eau de Parfum 50ml Spray. Eden Classics Le Jardin d'Amour Eau de Parfum 50ml Spray. Eden Classics Le Jardin d'Amour Eau de Parfum 30ml Spray. EDEN EAU DE PARFUM DA 30ML SPRAY.